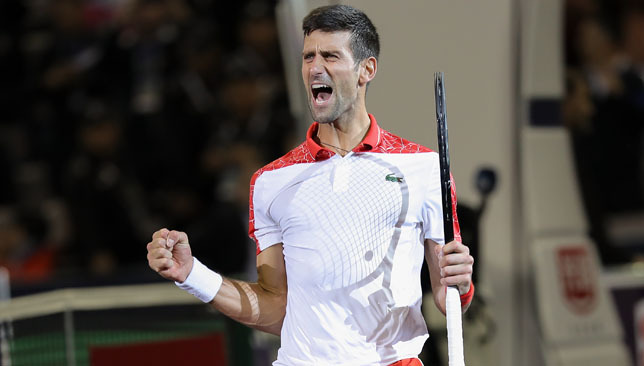 Novak Djokovic won the Shanghai Masters after a convincing 6-3 6-4 victory over surprise finalist Borna Coric in China. Djokovic secured his fourth title at the tournament and in the process moved a step closer to ending the year as world number one. The Serb extended his winning run to 18 matches in China, following up his successes at Wimbledon, the Cincinnati Masters and US Open. That was until, however, Djokovic made the breakthrough with a break in the seventh and ninth game to take the first set. Coric again battled well in the second set and saved three match points at 5-4, with Djokovic uncharacteristically smashing an overhead volley wide. However, the 31-year-old served out for the title, maintaining his record of not dropping serve during the week and becoming just the third player to win a Masters 1000 event without getting broken. The victory means Djokovic is now just 35 points behind Rafael Nadal in the race to end the year as world number one. 🏆🏆🏆🏆@DjokerNole wins his 4th @SH_RolexMasters crown with a 6-3, 6-4 victory over Borna Coric! WTA Finals rewind: How did last year's top-eight fare this season? Last year's WTA Finals line-up. The WTA season is edging closer to its big finale in Singapore, where the eight top-performing women on tour will fight for one last time in the Lion City. Singapore will end its five-year stint as host of the WTA Finals this month (October 21-28) before the season-closing championships move to Shenzhen next year. Five women have already locked down their spots for the farewell edition in Singapore – Simona Halep, Angelique Kerber, Naomi Osaka, Petra Kvitova and Caroline Wozniacki – while five other women are battling to grab one of the three remaining tickets. As we count down towards the action in Singapore, here’s a look back at last year’s WTA Finals field; who made it then, and where are they at now? Last year, Halep qualified for her fourth WTA Finals in Singapore but it was her first time there as a reigning world No. 1. The Romanian made it to the Finals on the back of an emotional 2017, where she reached five finals, including one at the French Open, but walked away with just one title, in Madrid. She missed out on multiple opportunities to rise to the world No. 1 spot for the first time before she finally took over the summit in Beijing in October. Although seven of the eight players in Singapore last year could have ended the year at the top of the rankings, Halep managed to stave them off and concluded 2017 as the tour’s leading lady. This year, the Romanian has held onto the top spot all season, barring the four weeks Wozniacki took over after the Dane’s Australian Open title success. Halep won her first Grand Slam this year, at Roland Garros, and picked up titles in Shenzhen and Montreal as well. She is dealing with a herniated disk at the moment but hasn’t pulled out of Singapore so far. After a stellar 2017 season that saw Muguruza win Wimbledon – her second Slam – as well as triumph in Cincinnati, the Spaniard went to Singapore as the No. 2 seed. She had spent four weeks as the world No. 1 from September 11, 2017 to October 8, 2017, and was named WTA Player of the Year at season-end. This year, Muguruza dropped out of the top-10 in the rankings, is not in contention for a spot in the WTA Finals, and has won just one title, in Monterrey, Mexico, last April. After reaching the semi-finals of Roland Garros in June, Muguruza was unable to win back-to-back matches for five consecutive tournaments (was also hampered by a right arm injury), an undesirable streak she finally snapped by reaching the last-16 round in Wuhan end of September. The 25-year-old is having a decent run in Hong Kong this week (has made the semis so far) and will probably be among the field in Zhuhai, where 12 players, ranked from the ninth position onwards in the Race, compete for a possible $673,300 dedicated to an undefeated champion (through round robin stage and knockouts). The Czech spent eight weeks as world No. 1 last season and was the No. 3 seed in Singapore. She won three titles from three finals reached in 2017 – Brisbane, Doha and Eastbourne – and made the semi-finals of Roland Garros for the first time. This year, Pliskova, who got married in July, has made even further progress on clay, winning her biggest title on the surface in Stuttgart and following that up with a semi-final showing in Madrid. The 26-year-old big-server also picked up a trophy in Tokyo but had an average Grand Slam season, reaching the quarter-finals in Melbourne and New York, the fourth round at Wimbledon and third round at Roland Garros. Pliskova is still fighting to secure one of the last three remaining spots in Singapore and is through to the semis in Tianjin this week, which means she can add to her points total in the Race, but can only guarantee her place in the WTA Finals next week, depending on other players’ results in Moscow. She had a coaching change this year, parting ways with Tomas Krupa after Wimbledon, and hiring Australian former doubles No. 1 Rennae Stubbs in August. The Ukrainian made a major step forward in her career in 2017, winning five titles, three of which were Premier 5s. She hit a career-high ranking of No. 3 as a result. In 2018, Svitolina started strong, winning the Premier tournament in Brisbane before making the quarter-finals at the Australian Open. She lost badly to Elise Mertens in that last-eight showdown in Melbourne though and ended her Grand Slam season without reaching an elusive semi-final on the Major stage. She defended her titles in Dubai and Rome but a subsequent significant weight loss seems to have affected her game. She’s still on track to be one of the last three qualifiers for Singapore but her survival in Hong Kong this week is in the balance as play was suspended due to rain with Svitolina trailing Wang Qiang 2-6, 2-5. The Chinese was serving for the match and a semi-final spot against Muguruza. As of right now, Svitolina is not entered in Moscow next week which means her qualification might depend on the results of others rather than her own. Svitolina parted ways with her coach Thierry Ascione after the US Open but is still with Andrew Bettles. After an impressive 2017 that saw Williams make two Grand Slam finals, in Melbourne and Wimbledon, and finish as runner-up at the WTA Finals, the American has had a tough 2018. She made two first-round exits and two third rounds at the Slams this year and is 17-11 win-loss overall this season. Her best results of the year came in March, when she made the semis in Indian Wells – she beat her sister Serena for the first time since 2014 en route – and the quarters in Miami. The 38-year-old was initially scheduled to play in Asia but she ended up withdrawing. Her last event the year was the US Open. She is already down to No. 22 in the world rankings and will sink even further when she drops the 955 points she picked up in Singapore last year. The Dane lost six finals in 2017 before she snapped her hoodoo and won Tokyo in September. She then finished her year on a high, triumphing in the WTA Finals and she ended the season ranked No.3 in the world. In 2018, Wozniacki picked up right where she left off, making the final in Auckland then winning her first Grand Slam at the Australian Open. That victory saw her return to the No. 1 ranking for the first time in six years. She stayed on top for four weeks before Halep reclaimed the top position. Wozniacki won Eastbourne and Beijing to make it 30 career titles and has already qualified for the WTA Finals for a sixth time in her career. Matching what she did in her stunning 2017 season this year was always going to be difficult for Ostapenko and she didn’t fare as poorly as many would have expected. Last year, the Latvian was unseeded when she shocked Halep to win the French Open, just a few days after turning 20 years old. Ostapenko also made the quarters at Wimbledon then won Seoul later in the season. She went 1-2 in her group matches in Singapore and finished the year ranked No. 7 in the world. In 2018, Ostapenko showed flashes of her 2017 form, making the final in Miami and the semis at Wimbledon, but she fell in the first round of her title defence at the French Open, and dropped a lot of points during the Asian swing, after having strong results there last year. There is a chance she makes Zhuhai but she is also dealing with a left wrist injury. Ostapenko went through some coaching changes, adding David Taylor at the start of the year, then parting ways with him and adding Glenn Schaap to her team midseason. The Frenchwoman enjoyed a late surge at the end of 2017, winning Wuhan and Beijing back-to-back to secure a spot in the WTA Finals for the first time. This year, Garcia has been quite open about her mental struggles, and even though she peaked at No.4 in the world in September, she is down to No. 16 this week due to her opening-round exit in Wuhan and third-round defeat in Beijing. Her year was highlighted by semi-final showings in Stuttgart, Madrid, and this week in Tianjin (plays Hsieh Su-Wei on Saturday). She played the fourth round at the Australian Open and Roland Garros.